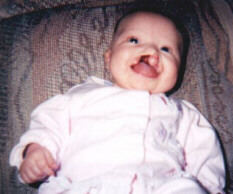 Cleft Advocate - Featured Families - October 2002 - Meet Ashlie! One Of This Month's Featured Families! Hi, my name is Alayna Cobb, mother of two and recently married. I have two daughters, Cameron (3) and Ashlie, who has a cleft. Please know that we understand you are going through a very difficult time right now, and know that we want to be there for you, to help you make it through. We, at Changing Faces, are sharing our stories in hopes that it will reassure you that even though it may not feel like it now,...things will be okay and you can make it through this very difficult time. You're not alone !!! I am so very proud of my daughter for everything she has been through and everything she has overcome. Ashlie is very strong physically, mentally, and emotionally. If there is one thing I can teach my daughter, I want it to be emotional strength : to look at the positive,...to overcome the negative,...to never play a "victim",...and to love everyone for who they are. I found out I was pregnant on January 5th, 2000. I had a wonderful pregnancy with nothing to complain about. I had a miscarriage in March of 1999, so naturally I was scared of it happening again. I was scared to bond, but loved my baby more than anything else in the world. I remember the tremendous sense of relief when we went to the Doctor and saw the heartbeat for the first time. I was so happy,...it brought tears to my eyes. It was at this point I knew things were going to be okay. When my pregnancy reached 41 weeks, my doctor gave me the option of being induced. I gladly accepted. I was so swollen and I don't think I could have got any bigger. I couldn't wait to meet my daughter. My induction was scheduled for September 14th, 2000 at 7:00 a.m. When I arrived at the hospital on the morning of the 14th, my contractions were 2 1/2 - 3 minutes apart and I wasn't even aware I was having them. My beautiful baby girl, Ashlie Tierra Stofer ~ Cobb was born at 3:29 p.m. on 9-14-00, weighing 7 lbs 1/2 oz, and was 19 inches long. As the doctor was checking her she said, "Alayna, I just want to warn you that she has a cleft lip and palate". I think my body was in shock from everything that was going on, and with me being scared, and things not going as planned, I don't think what she said really sunk in. I just remember laying there,...waiting for them to give me my baby. When I heard her cry for the first time, tears streamed down my face. I was so happy that s he was finally here. I got to hold her for a few minutes, then they took her from me and went to NICU. I was adopted at the age of 3 and my birth Mother had a unilateral cleft lip only. She went on to have 4 children and clefting wasn't passed to ANY of us. For this reason, I completely forgot about it during my pregnancy and it never crossed my mind that it could happen to MY child. I had 3 sonograms and Ashlie's cleft wasn't picked up in any of them. It was definitely a surprise when she was born, but she was still the most beautiful thing I'd ever seen. I remember sitting in the rocking chair in NICU, holding my daughter, and feeling like my life was crashing down before me. I remember at the beginning just wondering how we were going to make it from day to day, and to me it was a "crisis" . I was in shock and didn't know how to deal with any of it. Don't get me wrong, I love my daughter with ALL OF MY HEART, I just wasn't emotionally prepared. I remember being bombarded with lots of Doctors and lots of information. The only thing that registered with me, in the midst of my crisis, was when an NICU nurse came up to me, knelt down beside me, and showed me pictures of a cleft affected little boy. She showed me a picture of him at birth, and a picture of him years later. That let me know that things were going to be okay. my baby,...I just didn't want them to see her as "different". This was my baby and I loved her more than anything else in the world. I needed to protect her. I decided to go ahead and let family and a few friends come up. This was very uncomfortable because I knew that she was "different" and I knew that they "knew" that she was "different". I was worried as to how they would react, however everyone that came to visit was very supportive. We were in the hopsital for almost a week. After coming home, it hit me that this was real. It was very scary having so many things to deal with. Being a new Mother, being a single mother, moving backin with my parents, having a special needs baby, all of the doctor's appointments, the feeding issues, etc... This took quite some time to get used to. As time went on and we bonded, I began looking at "Ashlie", not her cleft. I loved the little person she was becoming. She was precious. I began noticing who she was on the "inside",...not who she was on the "outside". I noticed over the next few months that I didn't even notice her cleft anymore. And do you want to know something weird? 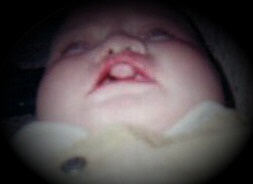 When I would look at other babies,...they would look like the strange one, not having a cleft. 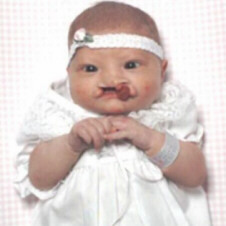 I have talked to other parents of cleft~affected children, and they did the same thing. Look at that BEAUTIFUL smile !!! That was my baby, and I loved that little smile !!! Before your child has surgery,...make sure to take LOTS of "before" photos,...because as strange as it may seem, you will MISS the cleft when it is gone. That is how you met your baby,...that is how you fell in love with your baby,...that is how you bonded with your baby,...and when it's gone ~ it's gone. 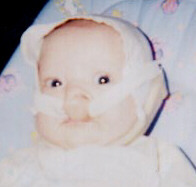 When Ashlie was about 2 months old, her plastic surgeon decided that since her premaxilla (the ball of tissue which is her upper gum area) formed so far to the side, he would like us to go see an oral / maxillofacial surgeon. Together, these 2 doctors were going to make a "bonnet" for Ashlie to wear. The oral doctor formed a retainer like substance that he molded to fit over the premaxilla. This retainer-like molding had an elastic strip attached to both sides, with a small piece of velcro at the ends. We went to the Rehab Services Department of a local hospital to make the actual "bonnet" part of it. uncomfortable, and I hated her having to wear it. She would cry,...I would cry,...Now I look back and laugh, after all we've been through, because it was really no big deal ~ it just seemed that way at the time. A couple months into wearing the bonnet, Ashlie's doctor decided that the bonnet had worked and that we were about ready for surgery. 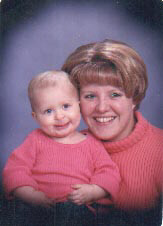 Ashlie's surgery was scheduled for 1/17/01, 4 months old. The first surgery would be the lip adhesion surgery. This surgery would bring together the 3 parts of her lip and would connect them in 2 spots. I was very nervous over the next month. I was almost in a panic. I loved my daughter very much and didn't want anything to hurt her, and I knew that this would change her (that's the whole weird "cleft being gone thing"). As the surgery approached, I couldn't think of anything else. I was very uptight, very stressed, and very worried. I became focused on nothing but HOW TO SURVIVE this upcoming event. The day of surgery was VERY hard. We had to be at the hospital at like 4:00 a.m. Ashlie couldn't have ANYTHING to eat for so many hours before the surgery, and the day was finally here. No turning back !!! I think this surgery was the hardest of all, because neither Ashlie nor I knew what to expect. In Pre-Op I got to meet with your plastic surgeon, your anesthesiologist, and some of the other medical personnel that would be taking care of you during your surgery. We come from a very loving and close knit church family. Some deacons from our church came and prayed with us while we were in Pre-Op and sat with our family until you were out of surgery. This meant a lot to Mommy because in the midst of a terribly hard moment, God shone through these men and gave me the strength to hang in there. I remember when it was time for her to go. That was the hardest moment of all. They let me carry her right to the doors of surgery,...and I had never experienced anything harder than having to hand her over to the nurse that was there waiting. I handed you to her after kissing you several hundred times and telling her over and over how much I love her. She turned and walked through the doors, and I watched her walk down the hall with her until I couldn't see her anymore. It was at this point that I lost it and began bawling !!! My heart was in my throat and I couldn't breathe. We spent the next hour and a half in the surgery waiting room. The phone call finally came, saying that she were out of surgery and that I could visit her in Post-Op. The nurse pointed me to some doors and when I walked in, I heard a cry I had never heard before,...one that made me want to fall to the ground. I immediately went to herr bed, held her hand, kissed her on the forehead and kept telling her "Mommy's here baby,...Mommy's here". After all she had been through and how strong she had been,...I decided that at every surgery I was going to buy her a rose and write her a little card to tell her how proud I am of her. This picture was taken a few months after surgery, but shows what the surgery did to the premaxilla. It was on the outside, and they moved it to the inside. This makes it in better alignment for future surgeries and for her teeth to come in. her. What I would have given for it to be me and not her. I kept reassuring myself that it would be okay, we made it through the last one, and we were ready for this one too. This surgery was to lengthen the area between her nose and her lip, to bring it down further, and to shape her nose. As her 1st Birthday was approaching, again we were preparing for yet another surgery. This one was going to be the palate surgery. This one really scared me. It was scheduled for 4 days after her Birthday. The 1st year of Ashlie's life was very rought for both of us. It seems that just as she was "back to herself" after one surgery,.....we were hit with another one. 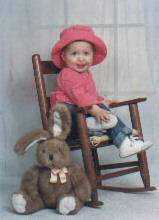 This is Ashlie at 18 months old. Isn't she beautiful ??? She has an awesome personality and is a very bright little girl. This definitely has not been an easy road, and there will be more obstacles up ahead, but it is all well worth it. I do not know pretend to know it all, but I would like the opportunity to be there for you if you're going through this tough situation. Please know that you have somewhere to turn. began looking for support in different places. I couldn't find any support groups locally, so I asked Ashlie's speech therapist to pass my name around to other cleft affected families she came in contact with. I found some cleft support groups on the internet, and this helped me in dealing with "my" feelings, concerns, and questions, but then I began thinking about my daughter,...the person who is REALLY going through this. After turning the focus back on Ashlie I realized that I, as her Mother, needed to provide support to her, and have resources in place for when she needs them. Ashlie's speech therapist passed our name around, as requested, and I was able to meet 3 other local cleft affected families. I truly think this is beneficial for everyone. We as parents can support each other by what we've been through, and our children can establish relationships with one another, so when they need support they too will have somewhere to turn. We, as parents, decided that we needed to do something to help others in similar situations. Myself and two of these families started a local support group, have pamphlets, a website, and tremendous support from the community, as well as the doctors !!! The website to S.E.E. Our Changing Faces is www.araweb.org/faces. I believe that it is very important to have contact with people in similar situations. Anyone can sit and listen to you, your problems, your concerns, and your questions, but no one really knows like someone who has "been there" . Though we have been down a very difficult road, Ashlie has proven to me in just 18 short months what a strong and determined little girl she is. She has taught me a lot and she's my world. I thank God every day for bringing her into my life, because she is truly a blessing !!! Visit Our Local Support Group! © held by the individual authors. All rights reserved. All stories and photographs reprinted by permission of the authors.